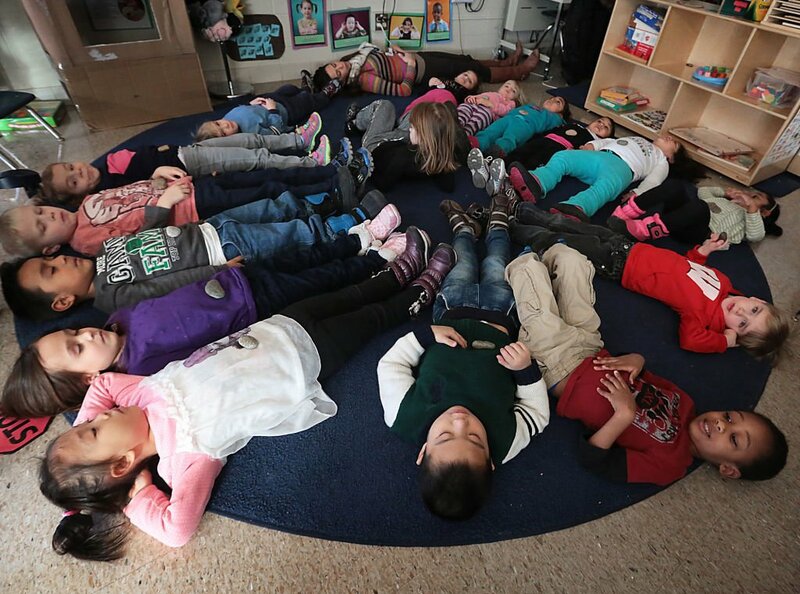 With "belly buddy" stones balanced on their stomachs, students in a kindergarten class for 4-year-olds at Madison's Stephens Elementary School participate in a breathing exercise related to the school's kindness curriculum. New research suggests the curriculum can teach compassion and improve students' ability to learn and pay attention. 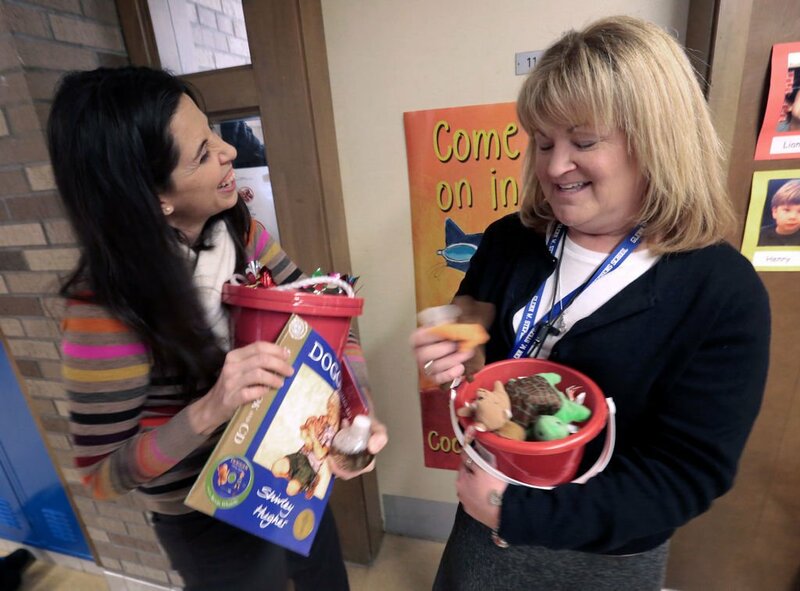 Stephens Elementary School teachers Kim Smith, left, and Pam Jung carry a collection of toys and props related to the school's kindness curriculum. Both teachers have been trained to teach the curriculum and participated in a related UW-Madison study. Students in Kim Smith's classroom at Stephens Elementary School in Madison participate in a breathing exercise related to the school's kindness curriculum. Using their hands as if they're balloons, the students inflate the balloons by taking deep breaths, then deflate them by exhaling. To learn empathy, students in Pam Jung's class at Stephens Elementary School are encouraged to react kindly to the imagined moods of small stuffed animals. "It's OK, I'll help you," student Zélie Klingele, left, says to her stuffed animal. Next to her is fellow student Belinda Xelhua. Stephens Elementary School student Marley Patterson views a collection of pinwheels, elements in the school's kindness curriculum. Children learn how to control their breathing by blowing on the pinwheels. Students in Kim Smith's class hold stones referred to as "belly buddies" following a meditative breathing exercise at Stephens Elementary School. Students in Kim Smith's classroom at Stephens Elementary School in Madison participate in a breathing exercise related to the school's kindness curriculum. Students at Stephens Elementary School in Madison participate in a breathing exercise. As soon as teacher Kim Smith mentioned “belly buddies,” 16 little bodies dropped to the classroom floor and fell silent. The children arranged themselves in a circle on their backs. Smith gave each one a small rock — the belly buddy — to rest on his or her stomach. “Watch it go up and down as you take your belly breaths and calm your body,” said Smith, who teaches 4-year-old kindergarten at Stephens Elementary School in Madison. The exercise, done regularly in Smith’s classroom, is part of a “kindness curriculum” developed at UW-Madison. By helping children focus on what’s happening to their bodies, the hypothesis goes, they will learn to respond with more compassion and less anger when they’re frustrated. It’s an appealing idea, and now hard science suggests it has merit. In a just-released study, UW-Madison researchers found that kids who had participated in the curriculum were less selfish and exhibited better social skills and greater mental flexibility than children who did not do the exercises. And in an added bonus, the kids who did the kindness curriculum earned higher academic marks at the end of the school year. The findings, recently published in the journal Developmental Psychology, are encouraging because they suggest that skills critical to future success, such as the ability to pay attention and to control emotions, can be cultivated, said Lisa Flook, the study’s lead author. “If we can promote these skills early on when there’s a lot of plasticity in a child’s brain, it could really improve future outcomes in so many areas, from the cognitive and academic to the social and emotional,” she said. Plus, the curriculum could simply help create nicer community members, the researchers said. To do the study, the researchers secured permission from the parents of 68 Madison students during the 2012-13 school year. All were in the district’s 4K program. Thirty children were randomly assigned to classrooms where they received twice-weekly kindness lessons for three months. Children in the control group did not receive the lessons. The curriculum is rooted in adult mindfulness-based practices adapted to a child’s developmental ability, said Laura Pinger, the curriculum’s lead designer. She and the other researchers are affiliated with the Center for Investigating Healthy Minds, the UW-Madison effort founded by Richard Davidson, an international leader in mindfulness training. The 24 lessons in the research study used hands-on activities involving music, books and movement. The “belly buddy” activity, for instance, allowed children to experience internal quietness, Pinger said. The kids also made homemade snow globes — jars filled with water and glitter. When a child got frustrated, he or she was encouraged to shake the “mind jar” and breathe deeply until the glitter settled. A poster of a “Friendship Garden” adorned each classroom wall. If someone did something kind for someone else, each child — the one who was kind and the recipient of the kindness — put a flower sticker on the garden. Later, the children were given numerous tests, including one called a “sharing task.” Students were given 10 stickers and told they could keep as many as they wanted for themselves and give away the others. “The children in the kindness group gave away roughly half of theirs, whereas the control group kept more for themselves,” Flook said. Additionally, teachers rated the children who’d been through the kindness lessons as more able to control their emotions and to show empathy. The kindness students also had higher report card grades in learning, health and social development at the end of the school year. Larger studies are needed to determine the curriculum’s true power, Flook said. Smith and Pam Jung, another teacher at Stephens Elementary School, were among those whose classrooms were used in the study. Both received extensive training prior to the study to help them teach the kindness curriculum, and both have decided on their own to continue using it. Jung said she explicitly teaches parts of the curriculum two or three times a week but that aspects of it are woven informally throughout every school day. The kindness lessons align well with the district’s own curriculum for the social and emotional development of children, called “Second Step,” she said. The technique gets raves from practitioners, who credit it with allowing them to be more resilient to stress. While survey respondents routinely report levels of stress above what they consider healthy, we're not doing very good as a society managing it. Joyful Path, faced with a loan-refinancing crisis, is making its case on an online crowdfunding site. Find a spot where you and your children can pause for a few moments and develop a sense of familiarity with quiet. Notice how you may become aware of things around you and in you in a new and different way. Take a walk outside and try to notice sounds of all types. Or, try a mindful eating exercise. Slowly, with quiet attention, explore a food item with all of the senses before eating it -- noticing the smells, colors, textures and any sensations of pleasure or displeasure. Cultivate gratitude in simple ways; for example, take a few minutes to reflect on the good things that happened during the day, keep a list of people and things for which you are grateful, or create a gratitude journal using words and pictures.